Voters in the eastern Indian state of Bihar are going to the polls in elections seen as a key gauge of Prime Minister Narendra Modi's popularity. Nearly 10 million people are eligible to vote in the first phase. Polling stations in Bihar opened at 7 a.m. local time (0130 UTC) in 49 constituencies for the first of five phases of voting for the state's legislative assembly. There are 583 candidates contesting the election in what is India's third-most populous state, with a population of 104 million people. Prime Minister Narendra Modi's Bharatiya Janata Party (BJP), which won a landslide victory in general elections last year, is facing an alliance of two powerful former chief ministers, including the incumbent, Nitish Kumar. The other, Kumar's predecessor Lalu Prasad Yadav, has served time in prison for corruption. 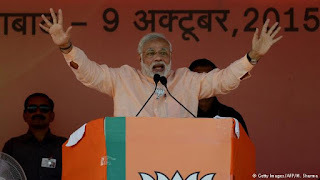 Modi has addressed several election rallies across the state (photo above), hoping the outcome will give his party the presence in parliament it needs to push promised reforms through India's upper house of parliament, where it lacks a majority. He has also promised billions of dollars for development in the state, where two-thirds of people have no access to electricity. Bihar has never been ruled by the BJP alone, with regional parties and alliances normally taking the helm. If Modi's party does win this one, the victory will be widely seen as approval of its Hindu right-wing political strategies. The BJP is still reeling from a humiliating defeat in February elections for the New Delhi state assembly, which it lost to a new anti-corruption party. The five phases of voting in the state will end on November 5, with results due on November 8.